In the spring of 1939 a small war erupted along the disputed border between Mongolia and Manchuria. A series of battles raged all summer between the Japanese Kwantung army and Soviet-Mongolian forces, ending in a decisive defeat of the Japanese. Japanese historians refer to this event as the “Nomonhon Incident”, and to the Russians and Mongolians it is known as the Battle in the region of the Khalka River (Khalkin Gol). I have been interested in this little known military conflict for several years, and devote a good deal of my modeling efforts to dioramas about it. A great number of Soviet BT-7 tanks were involved in the battle. It may perhaps have been their greatest hour. The BT tanks were based on the Christie tank – an American design that had been rejected by the US and other armies. The main features of the Christie were its springy suspension with large road wheels that could be run on with or without tracks; and its high speed and maneuverability. Though lightly armored, the BT 7’s 45mm high velocity gun was an excellent weapon for its time. The development of the BT tanks led to the much better known T-34 and its long list of descendants. At the battle of Khalkin Go!, the BT 7’s and BT 5’s far outclassed the Japanese armor. 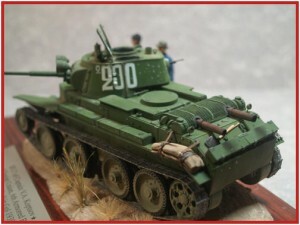 I chose to make this BT-7 kit from Eastern Express into a replica of Captain VA Koptsov’s tank as illustrated in some of the reference materials I have studied. Captain Koptsov lead a tank battalion though some of the heaviest fighting and was awarded “Hero of the Soviet Union” commendation for his actions. His tank was riddled with machine gun and small arms fire, showing how close the fighting was. I wanted to pose some figures outside the tank, which means leaving the hatches open, which poses the problem of what you will see inside. I was lucky to have found on a website, a series of good pictures inside a still-operable BT 7 tank. Though they were not complete, I had enough information to make a stab at my first scratch-built interior. The driver’s station through the body interior back to the engine was all built up out of plastic card and evergreen sticks pretty much. There were tons of machine gun magazine racks in these tanks, and I left some out because they were tedious and I wasn’t real happy with my method. I didn’t have enough magazines for them either, so I started casting some out of resin. The engine was a lot of guesswork, so I made it look as much like what was in the real thing as you can just see the front of it. But I did make some exhaust pipes (from melting q-tip plastics) which run just under the louvers at the rear where the screen is since you might be able to see them. I used wire and some authentic looking parts from the spares box for the engine. The shell racks are copper sheet strips bent and formed. The shells in the tank are from Hussar Productions. The turret was a little easier as I used a PE breech assembly and an aluminum barrel. One honeycomb shell rack was also a PE part from Eduard. The other racks were scratch built. The commander and gunners’ seats are from plasticard with some putty built up to simulate padding. This tank had searchlights, but the kit light part broke, and instead of fixing it, I just decided to make a new one that would actually light up. I used the kit part as a kind of vacuum form, stuck one on the end of a chop stick and jammed it into a piece of melting styrene a few times until I got a couple of half-way decent light parts. Then I embedded a tiny light bulb into each one with some epoxy. I made clear lenses for them using the same method with the kit’s opaque gray plastic lens part as a pattern. (I also made the periscope covers the same way so that I could show them open) I had to come up with a wiring method which is just a couple of strips of copper sheet on the turret ring for cont acts. The wiring itself mimics the actual scheme in a real turret of this type. The exterior detail includes some PE parts such as the fuel boxes and the tool bins on the back. The fuel boxes on the real tank got shot up, so the PE was perfect for replicating that effect. The main engine screen and exhaust pipes were made from sheet brass and sheet brass screen. The kit part was just a solid plastic screen textured abomination and the exhausts were too thick-walled, obviously. The canvas roll is made from putty and there are lots of little handles and things everywhere. In fact, as I write this, I have a hard time believing how much was involved in this project. 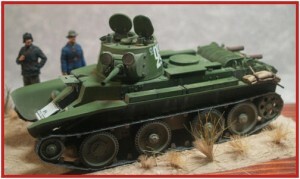 One last comment about the markings on the tank- I faithfully reproduced what appears in a photo and an illustration of this tank, even the small hand-painted “200” under the larger stenciled 200. There were supposed to be three figures for the diorama, representing the crew. I wasn’t very happy with what I had to work with, so until I find the gunner… (maybe he wandered off somewhere in the grass) However the two figures by the tank do seem to represent correct uniform of that time for that region. 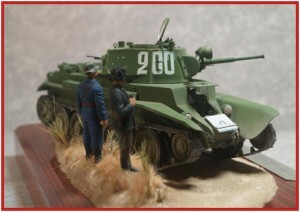 The commander is a TANK figure, and the driver is an 1CM figure with a (home-made) hat peculiar to the Soviet Far-East army. I think for me a great amount of my motivation for modeling comes from my passion for history.